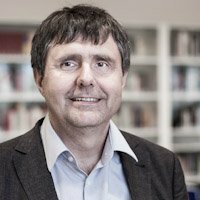 Peter Fratzl ist Direktor des Max-Planck-Instituts für Kolloid- und Grenzflächenforschung (MPIKG) und Honorarprofessor für Physik an der Humboldt-Universität zu Berlin sowie an der Universität Potsdam. In der Abteilung Biomaterialien des MPIKGs erforscht er das Bauprinzip natürlicher Materialien. Einerseits stehen hier mineralisierte Gewebe (wie Knochen, Zahn oder Muschelschale) und andererseits Pflanzen und deren Zellwände im Mittelpunkt seiner Forschung. Als Physiker interessieren ihn dabei vor allem die außergewöhnlichen mechanischen Eigenschaften dieser natürlichen Materialien, die sich ständig wechselnden äußeren Bedingungen anpassen. Die daraus gewonnenen Erkenntnisse über den Zusammenhang zwischen Materialeigenschaften und Struktur werden für die biomimetische Konzeption und Entwicklung neuer Materialien eingesetzt. Biomaterialien und biomimetische Materialien, hierarchische Materialien, Knochen. Bidan, C. M./Kollmannsberger, P./Gering, V./Ehrig, S./Joly, P./Petersen, A./Vogel, V./Fratzl, Peter/Dunlop, John W. C. (2016): Gradual conversion of cellular stress patterns into pre-stressed matrix architecture during in vitro tissue growth. In: Journal of the Royal Society Interface, vol. 13: 20160136. doi: 10.1098/rsif.2016.0136. Jayasankar, A./Seidel, R./Guiducci, Lorenzo/Hosny, A.S.F./Fratzl, Peter/Weaver, J. C./Dunlop, John W.C./Dean, M.N. (2017): Mechanical behavior of idealized, stingray-skeleton-inspired tiled composites as a function of geometry and material properties. In: Journal of the Mechanical Behavior of Biomedical Materials. doi: 10.1016/j.jmbbm.2017.02.028. Barbetta, A./Fratzl, Peter/Zemb, T./Bertinetti, L. (2017): Impregnation and Swelling of Wood with Salts: Ion Specific Kinetics and Thermodynamics Effects. In: Advanced Materials Interfaces, vol. 4, no. 1. doi: 10.1002/admi.201600437. Fratzl, Peter (2016): Bioinspirierte Gestaltung von Materialien. In: Doll, Nikola/Bredekamp, Horst/Schäffner, Wolfgang für das Interdisziplinäre Labor »Bild Wissen Gestaltung« (Hg. ): +ultra. gestaltung schafft wissen. Ausst.-Kat. Martin-Gropius-Bau, Berlin. Leipzig: E. A. Seemann, S. 177–182. Guiducci, Lorenzo/Dunlop, John W. C./Fratzl, Peter (2016): An Introduction into the Physics of Self-Folding Thin Structures. In: Friedman, Michael/Schäffner, Wolfgang (eds. ): On Folding. Towards a New Field of Interdisciplinary Research. Bielefeld: transcript, pp. 175–210. Fratzl, Peter/Kolednik, O./Fischer, F.D./Dean, M.N. (2016): The mechanics of tessellations – bioinspired strategies for fracture resistance. In: Chem. Soc. Rev., vol. 45, no. 2, pp. 252–267. doi: 10.1039/C5CS00598A. Forien, Jean-Baptiste /Zizak, Ivo/Fleck, Claudia/Petersen, Ansgar/Fratzl, Peter/Zolotoyabko, Emil /Zaslansky, Paul (2016): Water-Mediated Collagen and Mineral Nanoparticle Interactions Guide Functional Deformation of Human Tooth Dentin In: Chem. Mater., vol. 28, no. 10, pp. 3416–3427. Valverde Serrano, Clara/Leemreize, Hanna/Bar-On, Benny/Barth, Friedrich G./Fratzl, Peter/Zolotoyabko, Emil/Politi, Yael (2016): Ordering of protein and water molecules at their interfaces with chitin nano-crystals. In: Journal of Structural Biology, no. 193, pp. 124–131. Guiducci, Lorenzo/Razghandi, K./Turcaud, S./Bertinetti, L./Rüggeberg, M./Weaver, J./Fratzl, Peter/Burgert, I./Dunlop, John W. C. (2016): Honeycomb actuators inspired by unfolding of ice-plant seed capsules. In: PLOS ONE, vol. 11, no. 11, art. e0163506. doi: 10.1371/journal.pone.0163506. Kopf, J./Ulasevich, S./Baidukova, O./Zhukova, Y./Dunlop, John W. C./Fratzl, Peter/Rikeit, P./Knaus, P./Poznyak, S. K./ Andreeva, D. V./Skorb, E. V. (2016): Ultrasonically Produced Porous Sponge Layer on Titanium to Guide Cell Behavior. In: Advanced Engineering Materials, vol. 18, no. 4, pp. 476–483. doi: 10.1002/adem.201500456. Masic, A./Bertinetti, L./Schuetz, R./Chang, S.-W./Metzger, T.H./Buehler, M.J./Fratzl, Peter (2015): Osmotic pressure induced tensile forces in tendon collagen. In: Nature Commun., no. 6, p. 5942. Dunlop, John W. C./Fratzl, Peter (2015): Bioinspired Composites: Making a Tooth Mimic. In: Nature Materials, vol. 14, no. 11, pp. 1082–1083. Fischer, Franz D./Zickler, Gerald/Dunlop, John W. C./Fratzl, Peter (2015): Tissue Growth Controlled by Geometric Boundary Conditions: A Simple Model Recapitulating Aspects of Callus Formation and Bone Healing. In: Journal of the Royal Society Interface, vol. 12, no. 107, art. 20150108. doi: 10.1098/rsif.2015.0108. Guiducci, Lorenzo/Weaver, James C./Bréchet, Yves J. M./Fratzl, Peter/Dunlop, John W. C. (2015): The Geometric Design and Fabrication of Actuating Cellular Structures. In: Advanced Materials Interfaces, vol. 2, no. 11. doi: 10.1002/admi.201500011. Hoerth, Rebecca/Baum, Daniel/Knötel, David/Prohaska, Steffen/Willie, Bettina/Duda, Georg/Hege, Hans-Christian/Fratzl, Peter/Wagermaier, Wolfgang (2015): Registering 2D and 3D Imaging Data of Bone During Healing. In: Connective Tissue Research, vol. 56, no. 2, pp. 133–143. Degtyar, E./Harrington, M.J./Politi, Y./Fratzl, Peter (2014): The Mechanical Role of Metal Ions in Biogenic Protein-Based Materials. In: Angew Chem Int Edit., vol. 53, no. 45, art. 20141103, pp. 12026–12044. Guiducci, Lorenzo/Fratzl, Peter/Bréchet, Yves J. M./Dunlop, John W. C. (2014): Pressurized honeycombs as soft-actuators: a theoretical study. In: Journal of The Royal Society Interface, vol. 11, no. 98, art. 20140458, 2014. doi: 10.1098/rsif.2014.0458. Bidan, C. M./Kommareddy, K. P./Rumpler, M./Kollmannsberger, P./Fratzl, Peter/Dunlop, John W. C. (2013): Geometry as a Factor for Tissue Growth: Towards Shape Optimization of Tissue Engineering Scaffolds. In: Advanced Healthcare Materials, vol. 2 (1 Special Issue SI), pp. 186–194. Aizenberg, J./Fratzl, Peter (2013): New Materials through Bioinspiration and Nanoscience. In: Advanced Functional Materials, vol. 23, no. 36, pp. 4398–4399. doi: 10.1002/adfm.201302690. Abraham, Y./Tamburu, C./Klein, E./Dunlop, John W. C./Fratzl, Peter/Raviv, U./Elbaum, R. (2012): Hygroscopic coiling movement from a single layer is created by a tilted cellulose arrangement in stork’s bill awns. In: J. R. Soc. Interface, no. 9, pp. 640–647. doi: 10.1098/rsif.2011.0395. Lukas, C./Kollmannsberger, P./Ruffoni, D./Roschger, P./Fratzl, Peter/Weinkamer, Richard (2011): The heterogeneous mineral content of bone — using stochastic arguments and simulations to overcome experimental limitations. In: J. Stat. Phys., no. 144, p. 316. doi:10.1007/s10955-011-0209-8. Turcaud, Sébastien/Guiducci, Lorenzo/Fratzl, Peter/Bréchet, Yves J. M./Dunlop, John W. C. (2011): An excursion into the design space of biomimetic architectured biphasic actuators. In: International Journal of Materials Research, vol. 102, no. 6, pp. 607–612. doi: 10.3139/146.110517. Harrington, Matthew J./Razghandi, Khashayar/Ditsch, Friedrich/Guiducci, Lorenzo/Rueggeberg, Markus/Dunlop, John W.C./Fratzl, Peter/Neinhuis, Christoph/Burgert, Ingo (2011): Origami-Like Unfolding of Hydro-Actuated Ice Plant Seed Capsules. In: Nature Communications, vol. 2, art. 337. doi: 10.1038/ncomms1336. Harrington, M.J./Masic, A./Holten-Andersen, N./Waite, J.H./Fratzl, Peter (2010): Iron-Clad Fibers: A Metal-Based Biological Strategy for Hard Flexible Coatings. In: Science, vol. 328, issue 5975, pp. 216–220. doi: 10.1126/science.1181044. Antonietti, Markus/Fratzl, Peter (2010): Biomimetic Principles in Polymer and Material Science. In: Macromolecular Chemistry and Physics, no. 211 (2010), pp. 166–170. doi: 10.1002/macp.200900515. Paris, Oskar/Burgert, Ingo/Fratzl, Peter (2010): Biomimetics and Biotemplating of Natural Materials. In: MRS Bulletin, no. 35 (2010), pp. 219–225. Fratzl, Peter/Weiner, Steve (2010): Bio-inspired Materials – Mining the Old Literature for New Ideas. In: Adv. Mater, vol. 22, issue 41, pp. 4547–4550. doi: 10.1002/adma.201002127. Fratzl, Peter/Weinkamer, Richard (2007): Nature's hierarchical materials. In: Progress in Materials Science, vol. 52, issue 8, pp. 1263–1334.